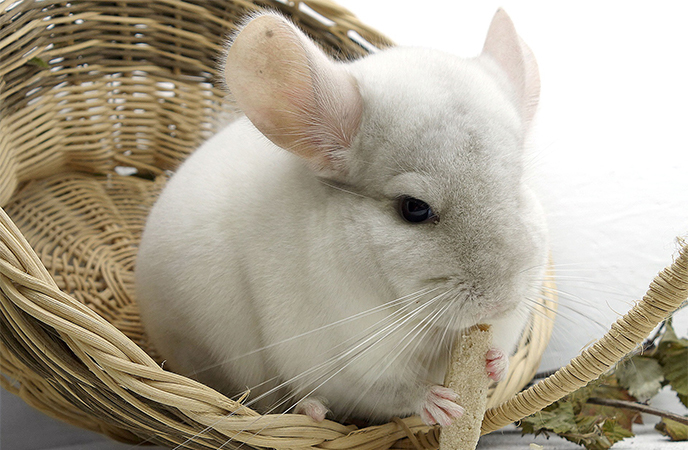 Welcome to our complete guide to chinchillas as pets. If you’ve wandered into a pet store and spotted a medium-sized rodent with large ears reminiscent of Mickey Mouse and a squirrel-like tail, then you’ve probably seen a chinchilla before. And if you’ve seen a chinchilla before, you may have considered purchasing one. 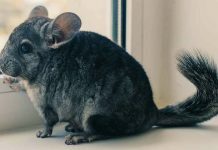 A chinchilla pet for yourself or your kids – what would that entail? In this article, we’ll discuss the behavior and care. As well as the cost of keeping one (or a few!) of these super unique rodents. Chinchillas may not be as prevalent as other small pets, such as bunnies, hamsters and guinea pigs. But don’t let this scare you away! Though they are an exotic species, chinchillas actually make very affectionate companions. Particularly for people who prefer a quiet and low-maintenance pet. If you’re looking for a furry friend to keep children entertained for hours, though, then a chinchilla may not be your best option. The reason being, chinchillas do most of their activity during the dawn and dusk hours. In between time, they prefer to doze and relax in their cage. However, if your household isn’t filled with quite as much activity, then a chinchilla may fit right in! Though we mentioned that chinchillas prefer to be reclusive for the majority of their waking hours, you can form a lasting friendship with a pet chinchilla. All it takes is a bit of time and trust. Since chinchillas are naturally shy and quiet, it may take them some time to get used to you, especially if they do not have a chinchilla friend to keep them company. You’ll be able to form a bond with your chinchilla by interacting with them consistently. We’ll talk more about this in our taming section below. Chinchillas do not often bite out of aggression or fear. However, they are known to take the occasional “love bite”. This is so because chinchillas, like cats, often express affection by nibbling a bit on your finger. They may, however, nibble on or attempt to “taste” your finger if it smells like something tasty! Chinchillas are shy and thus may scare fairly easily. In order to get your chinchilla to trust you, you’ll need to interact with it frequently. Before you attempt to handle your chinchilla, it’s best to get it used to your presence first. Start by approaching the cage slowly and quietly, preferably when the chinchilla is awake and alert. It might help if you talk to it in a calming manner. If this approach scares the chinchilla, he will retreat to the back of his cage or where ever his “safety zone” is. It may take a few tries of you approaching the cage and showing him that you’re not a predator. 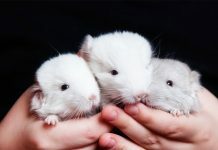 Once your chinchilla is okay with you approaching their cage, the next step is to physically interact with each other. 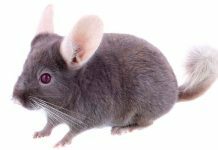 Just like dogs, cats, rabbits, and other rodents, you can use clicker training (signaling desired behavior with a click and rewarding it with a treat) to tame a chinchilla. Using this method, you can train your chinchilla to not hide when you approach his cage, to come to you, allow himself to be picked up, allow himself to be petted, and more. You can read our article on clicker training here. As mentioned in our Where Do Chinchillas Come From article, caring for a pet chinchilla is a bit different from caring for other caged animals. First and foremost, chinchillas are prone to heat stroke, so they must be kept in a cool environment. Secondly, chinchillas cannot be kept in wooden cages, since they enjoy chewing. Therefore, a wire-mesh cage is preferable. Be sure to include a solid section of the floor, though. Constantly walking on wire can hurt your chinchillas’ legs and feet. There are some limitations to the types of wire-mesh cages that are safe for chinchillas, though. According to the VCA Animal Hospital, https://vcahospitals.com/know-your-pet/chinchillas-housing cages with galvanized wire should not be used to house chinchillas because they contain zinc. Zinc can be toxic to chinchillas. In addition to the above housing requirements, be sure that your chinchilla’s cage has plenty of room for them to scurry around and to climb about. A ferret-type cage with multiple levels would be a great option. Furthermore, since chinchillas like to sleep during the day and prefer dark spaces for doing so, adding a cardboard box or small piece of pipe to the cage will ensure that your chinchilla has a place where they feel safe enough to rest. You can even add toys and wood blocks specifically made for rodents to chew on. It’s also a good idea to let them out of their cage in a quiet part of the house every so often. Compared to other rodents, chinchillas can be pretty expensive to purchase and keep. The initial cost of a chinchilla can be more than $100, depending on where you purchase it from and the color of the fur. Since chinchilla fur is a hot commodity in some parts of the world, you may pay more for a chinchilla with a fur color that’s considered to be more “valuable” than the standard gray. You’ll also need to factor in building or purchasing a cage, which may be more expensive than a standard rodent cage or hutch. One expense you won’t have, though, is for vaccines – chinchillas do not require shots of any kind! However, they will still require an annual veterinary exam for overall health, just like many other pet species. Yes, they make low-maintenance pets that will warm up to their owners with time and handling. They are great for people who aren’t home much during the day. Or for those who do not have loud and rambunctious households. Looking for an adorable and exotic pet that doesn’t need too much interference from you? Then a chinchilla could make the ideal companion!